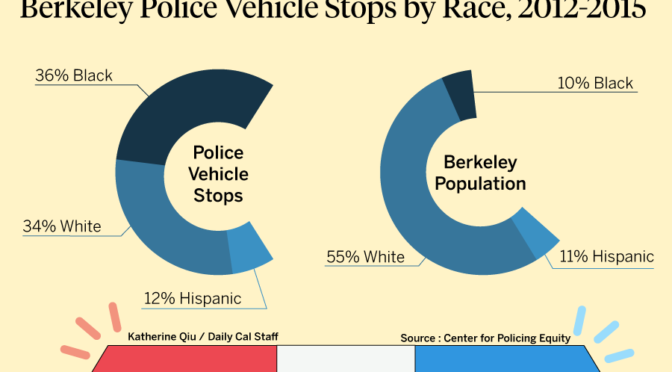 The famously liberal East Bay city of Berkeley has been engaged in a lengthy dispute about the release of a Center for Policing Equity analysis of police stop data that indicated significant racial profiling. The decision to release the report went all the way to the City Council which overrode the Chief of Police to make the report public. Here it is. The report is preceded by a memo from the Berkeley Police Chief explaining his thoughts and concerns about the draft report. It is probably fair to say that most, if not all, municipal police departments would yield similar or worse results when stop data is analyzed. It is to Berkeley’s credit that they proceeded with the report. Now the question is what will be done as a result.